I love metallic polishes, I just can't get enough of them. I especially like foil finishes, so I was very happy when I finally found a bottle lollypop lilac. Lollypop lilac is a mauve foil with excellent opacity. This was two coats, but it was pretty good with just one. It's in the same group of foils as Envy, Snazzle and Precious, and I think they make a great collection. The sun was behind a cloud for this pic, which is lucky, otherwise you would be blinded by its dazzling awesomeness. Love it! Next we have Precious, hang one didn't I already swatch Precious. Well yes I did, but this is the other version I found, and I like this one a lot better. It's not as foil like as the 'new' version, but it also is much less yellow, less brassy. This is more of a champagne colour. This was three coats. When I refer to this as the 'old' version, I'm only say that because the bottle doesn't have the same writing on the back as the new ones, but I only purchased this in the last few weeks, so they are still out there - you just might have to bin dive a few more places. 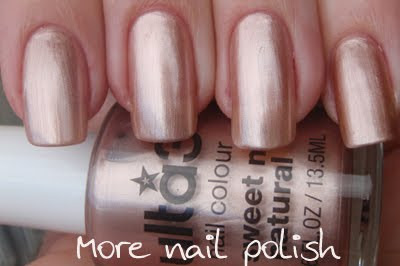 Sweet n natural has a bronze tone, it's paler and pinker than Antique Copper, but still has a metallic feel about it. It pic doesn't really do it justice, as the sun went behind the cloud again (you know we don't usually get this much cloudy weather here in Canberra - weird). This was three coats, as this polish is a little sheer. Sweet n natural is a perfect name for this, as it is very natural looking on the nail, but just with that something extra. Silver grey - I really wasn't looking forward to swatching this one, as I knew it was going to be nothing like snazzle, which I just love. But you know how it always is; you wait and wait, then finally put it on and wonder why you waited so long. I really was pleasantly surprised by this. It applies rather thinly, but three coats gives opacity. It's a tiny bit streaky, but not really that bad. The finished look it very much like a chrome polish. Very nice. Crystallina - This is a cool polish. It's a transparent white with a strong gold shimmer. I think it's really designed for layering, but it still looks pretty on its own. This was three coats and there is still a good visible nail line, but with this polish it didn't bother me. Well there you have the last of the metallic polishes. I think the metallic in the Ulta3 collection are outstanding for $2 and the wear on them is pretty good too. Even though I don't usually wear a polish for more than a couple of days, these lasted well with a coat of Seche Vite. I've decided I'm not a fan of metallics - it's taken me a while to realise it! Probably won't stop me buying them though. I love Crystallina though. Gold dusk - I can't even imagine not liking metallics. After holos they are my favourtie type of polish. Especially foil finishes. I'm going to have to order the Orly Foil FX from O/S. Hozuli - thanks so much. I just checked your blog too. You've done some great nail art. I love Lollypop Lilac! Just gorgeous! Sportsgirl polishes are $7.95, but they're often on sale for $4 or $5. I love Envy, it's absolutely gorgeous and has a fantastic formula - def worth checking out.